Click the Edit button for a song. Click the Add Recording button. In the popup window that appears, click the file selection button, then browse to the file on your computer and select it. The file name will be copied into the Name field automatically, but you can enter a new name if needed. If your recording is too large to sync over the Internet, click the Copy To Devices Manually option. Then you can install the recording directly on your devices. If you only want some users to see this recording, select the desired users. Click Save. Now the recording will upload, the popup will close and the recording name will appear on the edit page. You can repeat these steps to add more recordings, then drag and drop to rearrange them. Then click Save on the edit page. Zip your recordings together into a file up to 500MB in size. Log into the website and go to the Recordings page of the Repertoire section. Click the Batch Import form at the top of the page and select your zip file. To only attach recordings to existing songs, leave Add New Songs deselected. To create new songs for any recordings in the zip file that don't match an existing recording or song name, select Add New Songs. Click Submit. This will upload all the files, which could take up to an hour depending on your Internet connection. Replace existing recordings that have the same name. Attach new recordings to a song with the same base name. For example, a recording named "Freebird - no drums.mp3" will be attached to a song named "Freebird." Add a new song for any recordings whose names don't match any existing items, if Add New Songs is selected. View the recording from another app on your device and look for the "Open in..." command. For example, if someone emails you a recording as an attachment, you can tap the recording from the email message, then tap "Open in..." and choose BandHelper. You can also find the "Open in..." command in file sharing apps like Dropbox and audio editing apps. Unfortunately, GarageBand does not support this feature; to copy a recording from GarageBand you would have to email it to yourself, then use "Open in..." from the email message. This method only lets you copy one file at a time. In iOS, tap the Import button at the top of the Repertoire > Recordings list and select recordings to import from other compatible apps. This method only lets you copy one file at a time. In iOS 11 and above, open the Files app and browse to where your recordings are stored in another app or cloud storage account. Click the Select button and select the recordings you want to copy, then click the folder icon and select On My iPhone/iPad/iPod > BandHelper. Copy recordings to your device with the file sharing feature in iTunes. With your device connected, select it from the device button in the top toolbar of iTunes; then click File Sharing in the left sidebar; then scroll down in the Apps list and click BandHelper; then drag documents into the list. After copying your recordings into the app, you can navigate to the edit page for a song and follow the same steps for adding from the website, above. Adding recording from the Android app works similarly to the website, but you must first copy the recording to the directory the app is reading from. By default, this is /Android/data/com.arlomedia.bandhelper/files. If you prefer, you can set a different directory in Settings > Account Sync > File Download Directory. After copying your files into the correct directory, you can navigate to the edit page for a song and follow the same steps for adding from the website, above. After you've attached a recording to a song, you should see a recording button appear next to that item whenever it appears. Clicking the button plays the default recording, which is the first one in the list for that song. If you have attached more than one recording, you can hover over the button until a submenu appears, then click the desired recording name. A toolbar will appear with controls for skipping to the previous or next recording, pausing and playing, skipping to a different playback location or downloading the file to your computer. If you pause the recording from the toolbar, the toolbar will remain on the screen; if you stop the recording by tapping its icon again, the toolbar will close. When one recording finishes, the next one will play automatically and this will continue until the end of the list. 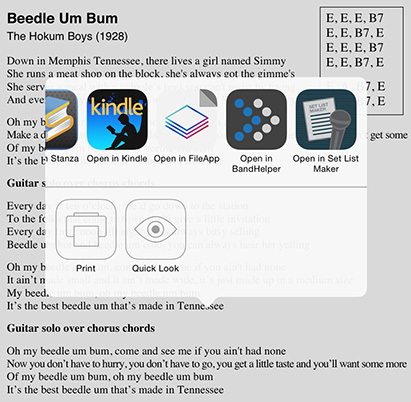 You can use this feature to set up a set list, then preview the set list by playing through it continuously. After you've attached a recording to a song, you should see a recording button appear next to that item whenever it appears. Tapping the button plays the default recording, which is the first one in the list for that song (unless you change Settings > General Settings > Defaults > Recording). If you have attached more than one recording, you can tap and hold the button until a submenu appears, then tap the desired recording name. In the Songs list, a recording toolbar will appear at the bottom of the list. This toolbar will only appear in a set list if the recording controls are included in the current layout. The recording toolbar's next and previous buttons will play adjacent recordings, if multiple recordings are attached to the song. You can also tap and hold the play/pause button to jump directly to any of the attached recordings. The recording toolbar will include a button to route the audio to AirPlay devices, if any are available. The recording toolbar will include a second row with skip, loop and speed controls in the set list view, if it is sized large enough in the layout. You can adjust the skip amounts at Settings > Audio & MIDI > Recording Skip Amount. You can tap the loop buttons to set start and end points, and tap them again to turn off the looping. You can slide the speed control to change the playback speed, and double-tap it to return to the normal speed. By default, the audio will stop when BandHelper reaches the end of the recording. 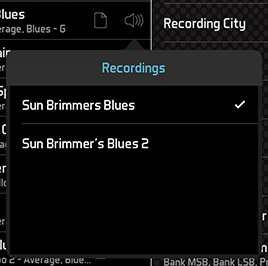 In the set list view, you can set up the next recording to play automatically. Go to Layouts > [layout name] > Edit Details > Layout Actions. Then set Recording Start/Stop to Song Selection and set Select Next Song to Song Completion. Then when you select a song in the set list view, its recording will play, and when that recording finishes, BandHelper will select the next song automatically, and its recording will play, and so on until you reach a pause, a set break or the end of the set list. BandHelper will wait for the time you defined in the set list as the Time Between Songs before starting the next recording, unless you turn on Layouts > [layout name] > Edit Details > Ignore Time Between Songs. By default, the audio will stop when you change songs. If you want to preview different songs while a recording for the current song is still playing, you can turn on Settings > Audio & MIDI > Continue Audio When Changing Songs. However, the audio will still stop if you leave the set list view. The iOS app can play .mp3, .mp4, .m4a, .aac (in an .mp4 or .m4a container), .aif, .aiff, .aifc, .wav and .mid files, but it cannot play DRM-protected files like "Protected AAC" files purchased from the iTunes Music Store. In iTunes, you can convert these files to unprotected MP3 or AAC files and attach those versions to your songs. The Android app can play .mp3, .mp4, .m4a, .aac, .wav, .ogg, .flac and .mid files. The website can play whatever files are supported natively by your web browser; this should include .mp3, .mp4 and .m4a files and might also include .aac, .wav and .ogg files. On iOS, you can optionally play two recordings at once, and if you connect a USB audio interface to your device, you can route each recording to a different output port. This is useful for sending a backing track to a house mix and a click track to a monitor mix. To play two recordings at once, turn on Settings > Audio & MIDI > Audio Options > Play First Two Recordings Together. To route the recordings to different output ports, select the ports in Settings > Audio & MIDI > Audio Options > Recording 1/2 Output Port. Your song layouts can include an on-screen volume slider, which controls the volume for any audio generated by BandHelper. This is different than the overall device volume, which you can control using the hardware buttons on the side of your device. If you move the volume slider to the left or right of the middle position, BandHelper's audio will play softer or louder compared to other apps. You can double-tap the volume slider to return to the default, middle position. You can also adjust the app volume on the fly by assigning a remote control device such as a Bluetooth or MIDI foot switch to the Volume Up and Volume Down remote control actions. If your recordings come from different sources and have different volume levels, you can save a volume override value for each recording. Navigate to the Repertoire menu for your database, then tap Recordings, then tap the name of a recording and use the stepper buttons to raise or lower the playback volume. Similarly, you can set the panning of a recording with the Pan slider on the recording edit page. Panning a stereo recording doesn't mean that sound from one channel will move to the other channel; it simply means that the relative volume of the two channels will be adjusted. If you are practicing with a recording, you can change its pitch, to play in a different key or adjust for an out-of-tune recording. See the Advanced Audio page for more info. If you're using backing tracks in performance and want to smoothly end a song, you can set a value for Settings > Audio & MIDI > Fade Out Recordings. Then when you click the button to stop a playing recording, it will fade out over that duration rather than stopping immediately. If you want to stop it immediately, you can click a second time.